"Russia will get its tail down and will not dare to act aggressively." The secretary of the National Security and Defence Council, Oleksandr Turchynov, has said that Ukraine is planning to send its ships through the Kerch Strait with the involvement of international partners. "Yes. This is a matter of principle for us. 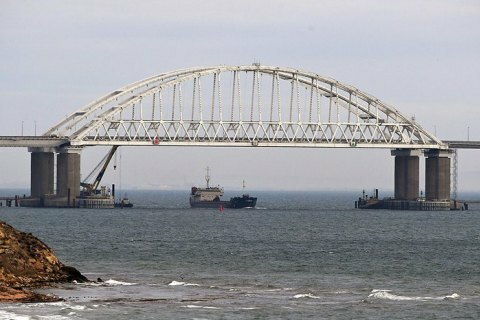 If we stop and retreat, Russia will actually complete its task of seizing the Sea of Azov, showing the world the new borders in the Black Sea it defined on its own and de facto legalizing the occupation of Crimea," he said in an interview with BBC Ukraine. He said it was an urgent matter. "We offer our partners to take part in this journey from Ukraine's Black Sea ports to the Ukrainian ports on the Sea of Azov," he added. According to Turchynov, Ukraine also plans to invite the OSCE and other international organizations, including NATO. "It would be very logical. For NATO ships which we would invite to the Sea of Azov ports to prove that Russia must honour international law. We have not received any response to our initiative yet. But I hope that by the next journey of Ukrainian naval ships through the Kerch Strait, they will at least have sent their observers," he said. "Russia will get its tail down and will not dare to act aggressively," he suggested. Turchynov recalled that "Russia was condemned but not punished" for its armed attack on Ukrainian naval ships off the Kerch Strait on 25 November.